Discover the enchanting islands of the east and central archipelago, each with their own individual characteristics. Arrive at Ponta Delgada airport and transfer to your hotel on Sao Miguel. Overnight at the Sao Miguel Park Hotel, Sao Miguel. Half Day Tour of Sete Cidades. Visit the Sete Cidades Lakes with a stop at the ‘Vista do Rei’ belvedere to enjoy the magnificent view over the lakes and the surrounding area. Return to Ponta Delgada, stopping en route at a pineapple plantation. Afternoon flight to Terceira (40-minutes). Overnight at the Do Caracol Hotel, Terceira. Full Day Jeep Tour. Enjoy an unforgettable drive along the islands’ best trails. Driving through trees and pastures often overlooking the Atlantic Ocean you will discover places and landscapes of rare beauty not often encountered by the average tourist. Experience milking a cow or learn how wine is made in the village of Biscoitos. During lunch time, taste the delicious ‘Alcatra’, a dish of rump cooked for 12 hours to intensify the flavours and textures at a typical restaurant, with a warm and friendly atmosphere. Visit the ancient Algar do Carvão volcanic pit (open Apr-Sep only). Transfer to Terceira airport for your flight to São Jorge (30-minutes). On arrival, transfer to your hotel. Overnight at the Sao Jorge Garden Hotel, Sao Jorge. Full Day Island Tour. See the fabulous Fajãs of Ouvidor, Cubres and Caldeira Santo Cristo. Visit a local co-operative where they make traditional woven goods and decorative garments. 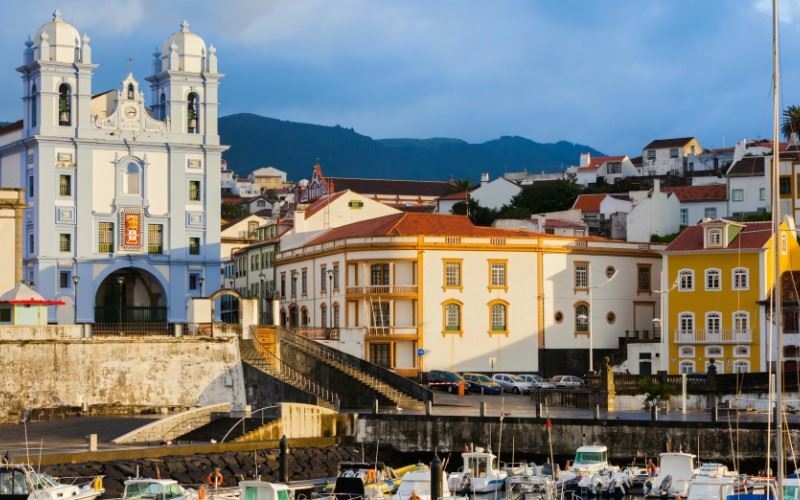 Head to Calheta and Manadas where you will visit an impressive baroque 18th century parish church dedicated to Santa Bárbara. Continue to Urzelina to see the only ancient church tower that remains standing after the destructive 1808 volcanic eruption, and the park of Sete Fontes before returning to Velas. Overnight at the Sao Jorge Garden Hotel, Sao Jorge. .
Sao Miguel - Transfer to São Jorge airport for your flight to São Miguel (1-hour). On arrival, transfer to your hotel. Overnight at the Terra Nostra Garden Hotel, Sao Miguel. Half Day Tour of Furnas. Visit the caldeiras in Furnas and continue to Pico do Ferro viewpoint for a different perspective over Furnas Lake. Then head along the coastal road towards Ribeira Grande with a stop at the Gorreana tea factory to taste the local black and green teas. Return to Furnas for a Cozido lunch, after visiting the area where the cozido is cooked in underground natural ovens. Saturday Transfer to Ponta Delgada airport for the return flight home to the UK. The São Miguel Park Hotel is located 200 metres from the city park and botanical gardens of Ponta Delgada. The São Miguel Park Hotel is located 200 metres from the city park and botanical gardens of Ponta Delgada. The building, originally used as a seminary, was completely remodelled and restored with few features remaining of the original academy. This comfortable, modern, city hotel has a host of facilities and, due to its central location, is only 5 minutes' walk to the commercial centre. 163 air-conditioned rooms including classic rooms, superior rooms, family rooms and a suite. The Do Caracol Hotel is well situated on the western side of Angra do Heroismo (20- minutes walk) and enjoys excellent views across the bay towards Monte Brasil (1,205m high). The Do Caracol Hotel is well situated on the western side of Angra do Heroísmo (20-minutes walk) and enjoys excellent views across the bay towards Monte Brasil at 1,205m. This stylish hotel, which has adopted an almost nautical theme in its choice of colours and design, is perfectly suited for both couples and families alike. A wide choice of leisure facilities and sporting activities make it the ideal choice for an extended stay on the island. This modern, friendly hotel is well situated on the oceanfront of Velas, the island’s capital which is located on São Jorge’s southern coast. Within a 5-minute walk guests can reach this small compact centre with its pretty square and park, a harbour with regular boat crossings to Pico and Faial, and a selection of restaurants and bars. The hotel affords wonderful views of Mount Pico, across the water, which can be enjoyed from all the guestrooms, as well as from the panoramic breakfast room. There is a large outdoor salt water pool, with a separate area for children, and surrounded with sun loungers. The rooms are simply decorated in neutral colours and have wooden furniture. Although the hotel has no restaurant, the town centre, which has a good choice of restaurants, is 200 metres away. The Terra Nostra Garden is one of the best hotels on the island of São Miguel and well positioned next to the Terra Nostra botanical park. The Terra Nostra Garden is one of the best hotels on the island of São Miguel. Well positioned next to the Terra Nostra botanical park, the hotel is made up of two adjoining buildings: the Art Deco Wing, built in the 1930’s which has maintained its architectural history; and the Garden Wing, added much later in the 1990’s. Many of the bedrooms, along with the restaurant and indoor swimming pool, enjoy fabulous views over the world famous, extensive botanical gardens - owned by the hotel. Guests dining here are treated to local Azorean products, with a focus on the Cozido, a sustainable meal fully cooked underground using the natural heat of the volcanic hot springs - a must for any visitor to the islands.